A brown dwarf is a celestial or an astronomical object having a size between a small star and a giant planet, like Jupiter. In other words, brown dwarfs are too large to be classified as planets and too small to be called a star. As far as their origin is concerned, brown dwarfs resemble stars, as both the astronomical bodies are formed when cold interstellar clouds of gas and dust collapse. But unlike stars, brown dwarfs fail to sustain the thermonuclear fusion of hydrogen, which gives the stars their luminosity. As a result, they do not shine like stars, but glow faintly by radiating heat at infrared wavelengths. For this reason, many scientists call them ‘failed stars’. In this article, we’ll find out some interesting facts about brown dwarfs and how they are formed. 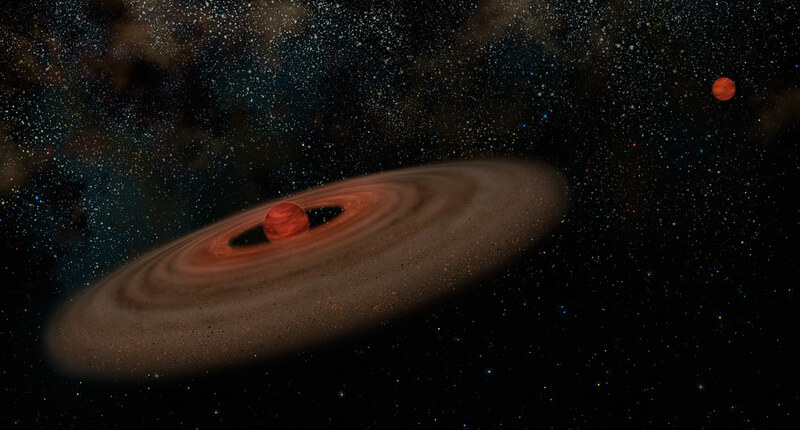 How are Brown Dwarfs Formed? As mentioned already, a star is formed due to the contraction of interstellar cloud of gas and dust. This contraction causes the release of gravitational potential energy, which in turn, heats up the cloud. As a result, the temperature in the core rises to such an extent that it paves the way for thermonuclear fusion of hydrogen. An enormous amount of energy is released due to thermonuclear fusion reactions, where hydrogen is converted to helium. This causes stars to shine and also prevents their further contraction, which in turn, keeps the size and luminosity of stars constant for a long time, often for billions of years. Brown dwarfs above 60 Jupiter masses undergo thermonuclear fusion of hydrogen, but fail to sustain the reactions due to their low mass.